Qualcomm has announced three new worldwide processor launches for the mobile market. The new chipsets land in the mid-range 600 and 700 series, and bring a novelty for gamers. Arriving to replace the 660, the 665 doubles the performance capacity compared to the previous one. Highlights include 4.5G support, high quality audio and 11nm manufacturing for energy savings. In cameras, it now supports triple sets with telephoto, wide and super wide, up to 5 times optical zoom, plus hybrid autofocus, 48MP photos, low light night mode and more. It is also possible to have portrait mode (bokeh) with just one camera and 3D facial unlock. It has eight semi-customized Cortex-A73 cores, four of which are 2 GHz and four are 1.8 GHz. The GPU is Adreno 610. 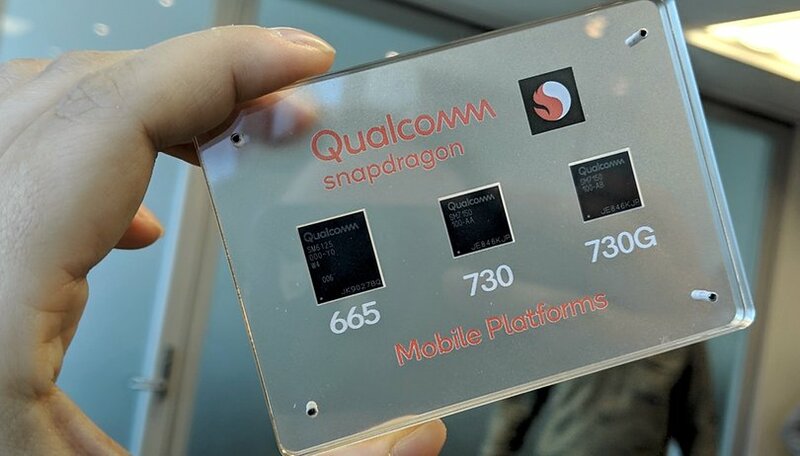 This other novelty is more attractive since it is the successor of the 710 and is a derivation of the top of the line of 2018, the Snapdragon 845, bringing some of its features, some for the first time in intermediates. It is also an octa core, built in 8 nanometers and two A76 2.2 GHz ARM cores and 6 A55 1.8 GHz ARM cores. It brings support for the new Wi-Fi 6, known as ax, and also Qualcomm's X15 modem, which reaches speeds of 800 megabit per second, a good for the 700 series. In photography, the 730 features Qualcomm Spectra 350 and supports 4K video with HDR, instant video bokeh effect and sensors up to 92 megapixel. Once again, artificial intelligence is widely cited by the company. "With the introduction of Snapdragon 730, 730G and 665 mobile platforms, we are bringing features such as sophisticated AI, exceptional gaming and advanced camera capabilities to a broad spectrum of devices with exceptional performance" - Kedar Kondap, vice president of product management for Qualcomm Technologies, Inc. There are targeted elements, such as a Tensor accelerator, which serves to improve the performance of artificial intelligence. It also has news for voice assistants: new words have been added, as well as a superior audio codec for a better understanding of the commands. The surprise was for this new variant of the 700 series, which has the prefix G, showing that it is aimed at games and gamers. It is basically the same thing as the 730, but with improvements and overclocks to work better with games. The Adreno 618 GPU is 15% more powerful. This is the most interesting of them, since it opens space for gamer smartphones not as expensive as those that have been launched. Currently, gamers are already playing much more on mobile platforms than on computers or consoles, so something more economical has a lot of potential. Other features include ideal game specifications such as gaming HDR, anti-cheat extensions, color gamut enhancements, and latency manager, which selects the best Wi-Fi network over latency. As we know, this is as important an item as powerful processing for a fluid game play. The three new platforms integrate the Vulkan 1.1 graphics library, which is more effective on the mobile than Open GL ES, and also bring support for aptX Adaptive Audio and Qualcomm Aqstic for high-quality audio. É muito interessante acompanhar a movimentação das empresas no sentido de oferecer eficiência e desempenho em jogos para aparelhos intermediários. Off the subject of games, the 730G has the addition of the Cinemagraph feature in the camera, plus super slow motion videos in HD at 960fps. There is less battery drain for voice activation. The company explained that it worked in partnership with major game developers to achieve the best optimizations for popular titles such as PUBG. The goal is precisely to bring these premium games to the intermediaries, below the 800 series. All Qualcomm launches are expected to integrate new smartphones in mid-2019.